On the afternoon before my last chemotherapy treatment, I succumbed to the stress and exhaustion that had been building for weeks and I began to sob. Rain beat relentlessly against the French doors leading out onto our patio while I lay inside on a sofa in the family room halfheartedly watching a marathon showing of all the Downton Abbey episodes from season two. It was a Sunday and the nausea from the treatment I had received the previous Monday had just subsided. I hadn’t been well enough to go to church that morning, something which grieved me greatly, and the thought of subjecting myself to renewed nausea for another week was just too much to bear. I had had enough. Gil came over and put his arms around me and I cried into his shoulder. He knows me so well and he knows just what to say whenever I fall into such a deep emotional pit. He knew that I was feeling trapped and so he told me I didn’t have to go through with the chemo treatment if I didn’t want to. I could call it quits – and I would have his full support. So I did undergo that final chemotherapy treatment the next day. And as with my very first one, six weeks before, my friend Sam picked me up early on Monday morning, February 20, drove me over to the UNC Cancer Hospital, and sat with me while the chemotherapy drugs dripped into my vein. I also talked with some of the other patients receiving their infusions nearby and told them that this would be my last one. I wrote down their names and said that I would be praying for them. Once my I-V was out, a nurse presented me with a certificate celebrating the fact that I was done. Now all that was left until I was completely finished with my course of treatment was five more radiation treatments. In the radiation oncology department, which is in a sub-basement of the Cancer Hospital, a patient’s final day of treatment ends with more pizzazz than it does on the second floor where infusions are administered: A gong is available for a patient to strike on his or her final day of radiation treatment. I had witnessed a number of such celebrations since I had begun undergoing daily radiation treatments in early January, so I had been eagerly awaiting the day on which I would strike it. In anticipation of that day, I asked my friend, Susan whether she would be willing to be my chauffeur on my last day of radiation treatment. She had undergone radiation six years before for the same kind of tumor and she helped to prepare me psychologically and spiritually for my treatments. Susan was delighted I asked, and to mark the celebration she offered to take a picture of me at the just right moment. 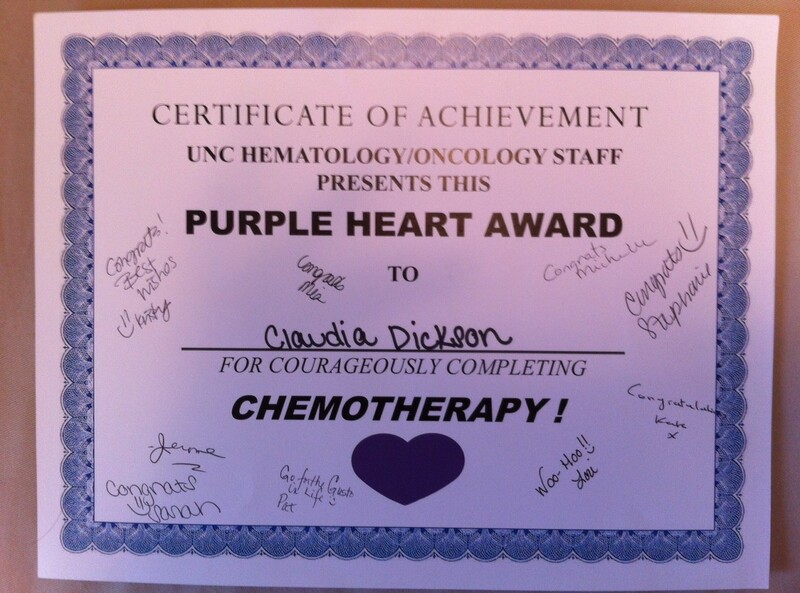 So on Friday, February 24, 2012 I underwent my thirty-third and last radiation treatment. As I lay in the Tomo machine, I listened to the third portion of Handel’s Messiah, paying special attention to the words from my favorite selection, “Worthy is the Lamb.” And then, in just a matter of minutes, it was finally over. The technicians escorted me back out into the waiting room and led the applause as I picked up the hammer and struck the metal gong. Susan snapped a picture and then I posed again, hammer in hand, in front of the gong. The feeling was exhilarating! But the well-being I enjoyed that day was short-lived. When I woke up the next morning I discovered that the inside of my mouth and throat were covered with sores. I felt intense pain when I swallowed and I was nauseous again. Only then did I remember that I had been warned by one of the radiation oncology nurses that I was likely to feel even worse after the treatments ended than I did while they were taking place because the effects of radiation are cumulative. Furthermore, she told me that the side-effects would only begin to taper off about a week after the treatments ended – and the taper would probably take up to eight weeks. She also said that if my sense of taste returns – and there was no guarantee that it would – it could take up to six months. So I could eat barely anything that weekend because it hurt too much to swallow and I worried about how much more weight I might lose. Weight loss is a big concern for patients with a head or neck cancer undergoing radiation treatments. It is often difficult for them to eat because of mouth and throat pain, as well as the loss of their sense of taste – and if they lose more than ten percent of their weight during or just after their treatments, they are at risk for developing additional health problems. So, the insertion of a feeding tube is usually prescribed when weight loss exceeds ten percent of the patients’ body weight – and I was nearing that point. My biggest fear was that if a feeding tube was inserted, I would be dependent upon it for months, not weeks. Again, I was immobilized by fear and despair, as I had been at several points since I was diagnosed with cancer. But each time previously, the Holy Spirit re-directed my thoughts so that I was able to pray, despite my anguish, and listen for God’s direction instead of my own despondent musings. Thankfully, this time was no different. As I lay in bed, I decided to try and find something inspirational on television. I reached for the remote control and searched for a Christian network. When I saw Beth Moore’s face on the television screen, I knew I had found what I was looking for. I’ve listened to her Bible studies on television for a number of years and she always has a message that both challenges me and helps to strengthen my faith. Two days later I met with my medical oncologist for the first of five weekly post-treatment appointments at which I would be weighed and a sample of my blood would be drawn and analyzed to see if my immune system was recovering from the effects of the chemotherapy drugs. In addition to destroying cancer cells, chemotherapy also kills off white blood cells, an important component of the body’s immune system. As I told Dr. Hayes about the nausea I was experiencing, he thought it might be the result of acid reflux, a condition often caused by chemotherapy, and he prescribed a medication to combat the reflux. He was not overly concerned about my weight loss and assumed that once I began taking the medication, I should begin to feel much better. He also assured me that the severe mouth sores were to be expected, but that they should begin to heal quickly, now that I was finished with radiation, and that I should be able to swallow again without pain soon. I was so elated by this good news that I felt adventurous enough to try eating a small portion of a Big Mac once I had returned home and had taken a dose of the medication. By God’s grace I was able to consume it without stomach upset. Since my next appointment would not be for another week, Gil and Caleb and I decided to spend the remaining days of their winter break from school at our friends’ condo on Wrightsville Beach. The timing of this trip was ideal because I was beginning, at long last, to feel better. I was able to take short walks on the beach and my mouth and throat had healed to the point where it no longer hurt to swallow. Although it would still be many months before my sense of taste returned fully, eating was no longer something I had to endure. Life was beginning to be enjoyable again. Next Installment: The leak from the kitchen ceiling returns – and something far more sinister.